With the help of tons of friends, I have found a great person to sub-let my duplex and take care of my precious cats while I’m gone. So the next step was to purge the non-essential by-products that I have steadily acquired since I have been living in the same city, and nearly the same home, for 11 years – my longest stint in one place since childhood! I arrived with only what would fit in the back of my car and have successfully accumulated way too much stuff. So Sunday I had a moving sale. My mom and dad and a good friend came up to help and we sold like crazy. Although exhausted and the house is now just pieces of “stuff” all over it and is filthy, I feel lighter already. 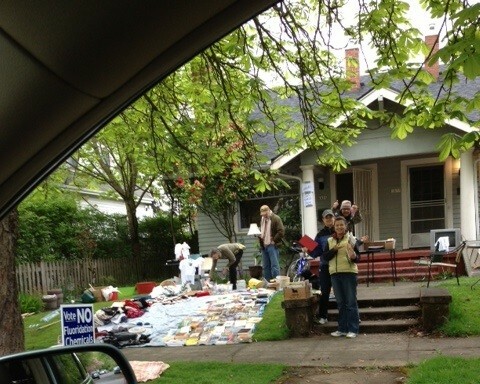 Here’s a shot of one side of the yard – full of books, gardening tools, CDs etc. – the other side, not shown was full of the furniture. I haven’t even started to think about the actual teaching part! That comes next week after all the moving and packing is done. But of course my excitement hasn’t waned, so here in there, as the thoughts pop into my mind, I jump on Google and search for fun tidbits about the country. The latest 5 minute foray was focused on food. And what I found looks mighty delicious! Laphet Thohk – Green Tea Salad It’s a famed dish, a salad made from pickled tea leaves. Apparently Burma is one of only a few countries in the world that drinks and eats tea leaves. The texture of the salad was unique, a adoring combination of soft, crunchy, crispy, and saucy. I could eat this salad constantly for days. Ok, time to get back to work… clean the house and get what’s left organized. I’ll try to post one more time before I head out. I am so excited!!! Hope you’ll stay with me on Sunshine Impressions!